In July of 1944 two middle-age women were arrested on one of the Nazi-occupied Channel Islands – Jersey, to be exact. It seemed that they were the “masterminds” of a resistance propaganda movement that had been operating locally and although they had acted alone, it was just so unlikely that both were strenuously interrogated in order to ascertain the identity of their (non-existent) accomplices. They attempted suicide, probably with a concealed stash of barbiturates, but were eventually revived and had to endure months of further imprisonment, in deplorable conditions. The two were saved from execution only when it became apparent that Allied forces would soon take control of the island, as indeed they did, early in March 1945. These women, whom both the local population and their Nazi captors alike considered to be eccentric spinster sisters, were Claude Cahun and Marcel Moore. After the war they returned to their life of quiet isolation, but Cahun’s health had been severely affected by her imprisonment. Worn down by illness, she died in 1954, while Moore took her own life in 1972. Extraordinary as all this undoubtedly is however, the truth is indeed more complicated than it first appears. Cahun and Moore were, in fact, Lucy Schwob and Suzanne Malherbe – stepsisters, lovers and artistic collaborators. Together they produced some of the most enigmatic and challenging photographs in the history of the medium, nominally self-portraits by Cahun. Although this work has been little known until recently, enjoying a brief notoriety with the rise of gender studies in art history and academic circles, it traces, at least in part, another linage within photography. So while these works are perhaps too wilful, too hermetic to be regarded as an influence on the development photography in general, the photographs they produced really illuminate, with their own dark radiance, the misunderstood potential that photography has to make the unseen visible, to create new, if uncertain, realities. Moving in the radical and avant-garde circles of 1930’s Paris they had met André Breton, the architect of Surrealism, and were undoubtedly influenced by his ideas about the irrational and the unconscious in art. Immersed – if never quite at ease – in this heady creative atmosphere Schwob (not yet Cahun, but operating under a host of increasingly ambiguous pseudonyms) dedicated herself to writing and along with Malherbe was deeply involved in cutting-edge theatre productions. But in 1937, tiring of the fevered atmosphere in Paris (along with worrying political changes in Germany) they moved to the island of Jersey, where they had previously spent summers and in this private world began to concentrate entirely on their work, though they by no means lost contact with their old associates, at least until the outbreak of war. The question of collaboration – and indeed of authorship – remains a thorny one, however. Most of the pictures, and certainly the best of them, feature Cahun in various guises. It is for this reason that the usual definition of the photographs is as self-portraiture, but again, nothing with this work can be as easily defined. In truth, it is difficult to know exactly what their intentions might have been. A lot of the photographs and related material were irretrievably lost or destroyed during the occupation, and what now remains, though not an insubstantial amount, is fragmentary, so whether the pictures were to be understood as artworks in their own right, as studies for a larger project, or as documents for performances even, will probably never be fully known. Since the rediscovery of the work a surprisingly diverse body of critical writing has sprung up, trying to fill the gaps in our knowledge about Cahun and Moore. It seems that in many cases that the attention given to Cahun’s electric presence in the photographs has somewhat obscured the role Moore (an accomplished illustrator in her own right) undoubtedly played in their creation, given that they had already collaborated on a series of collage works titled Aveux non avenus. Regardless of whatever their respective roles may have been, there can be no question that the photographs are “about” Cahun – her face is just another mask and she never comes to the end of them, never exposes what the masks might conceal – supposing it’s anything at all. In retrospect it’s not hard to see their profound sympathy with the concerns of Surrealism, if not a direct influence, given that they worked in a determined isolation, far removed from the movement’s cosmopolitan centre in Paris. This is perhaps not unsurprising, because for all its radical intent Surrealism was, at heart, a boys club, with women in the role of Muse only and as such, incapable of action. It is worth noting however, that Breton’s insistence on the objective recording of “irrational” interior processes resembles closely the matter-of-fact treatment that Cahun’s transformations receive. Seen on the wall or on the page the images appear at first like snapshots, anonymous and banal, like countless others in fact, interesting perhaps in that they recount the mystery of unknown lives and the passage of time, but too distant otherwise to be meaningful. Look again though and we see the alchemy of self being played out, using the modest tools of amateur photography – these are snapshots from another reality and this is their fracture; you are not who you were, but someone else – a woman being a man becoming a woman becoming other, in some indeterminable fashion, prey to a confusion of identity in the deepest sense, which endlessly flows back and forth across the space of who you are, a prismatic breaking of those codes that make up an identity, a name, calling into question any firm idea of who “you” might be. That face in the mirror with its established contours and gestures – is that really you? Well, of course it is, and that’s what’s so wrenching, so profound about these photographs, the knowledge that it’s only “you” until it’s not, until the ground shifts and you can’t be sure of anything, the mask is off and even its absence is nameless. 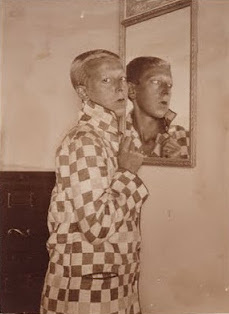 Claude Cahun is the face of the 20th Century.